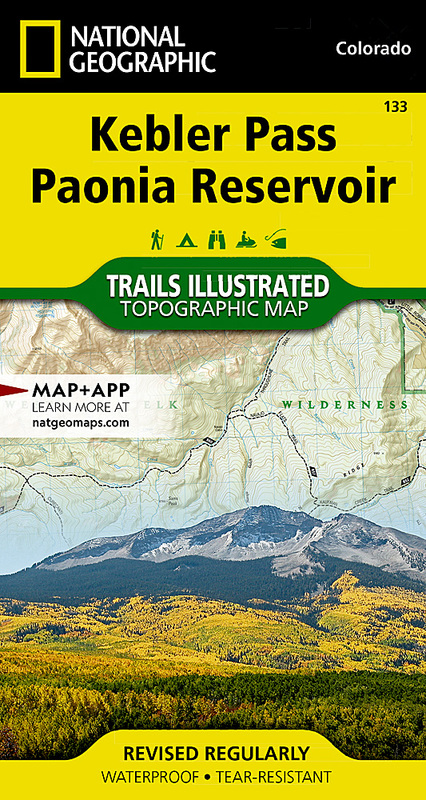 National Geographic's Trails Illustrated map of Kebler Pass and Paonia Reservior offers outdoor enthusiasts unparalleled detail of this untamed mountainous area with endless recreational opportunities in central Colorado. Created in partnership with the U.S. Forest Service, Bureau of Land Management and others, this expertly researched map covers key areas of interest including Gunnison National Forest, West Elk Mountains and Wilderness, Raggeds Wilderness, Snowshoe Canyon and Mesa, Ruby Range, Scarp Ridge, Paonia State Recreation Area and North Fork Gunnison River. Get off the beaten path and back on again by following the map along hiking and motorized trails, hard surface and mountain bike routes, snowmobile trails or Forest Service roads. The West Elk Loop Scenic Byway is noted for those exploring the area by car. To aid in your navigation of the area, the map also includes contour lines, elevations, labeled peaks and summits, water features, selected waypoints and clear boundaries between public and private land. Some of the many recreation points of interest pinpointed are areas for camping, cross-country and alpine skiing, swimming, water skiing and fishing. Additionally, wilderness regulations, survival tips and essential contact information is provided. Other features found on this map include: Anthracite Range, Gunnison National Forest, Marcellina Mountain, Mount Gunnison, Raggeds Wilderness, West Elk Wilderness.